A stupendous effort from Adam, curled towards the top corner. This time it hits the post on the other side with the keeper beaten there as well. Stoke could and should be winning this one. 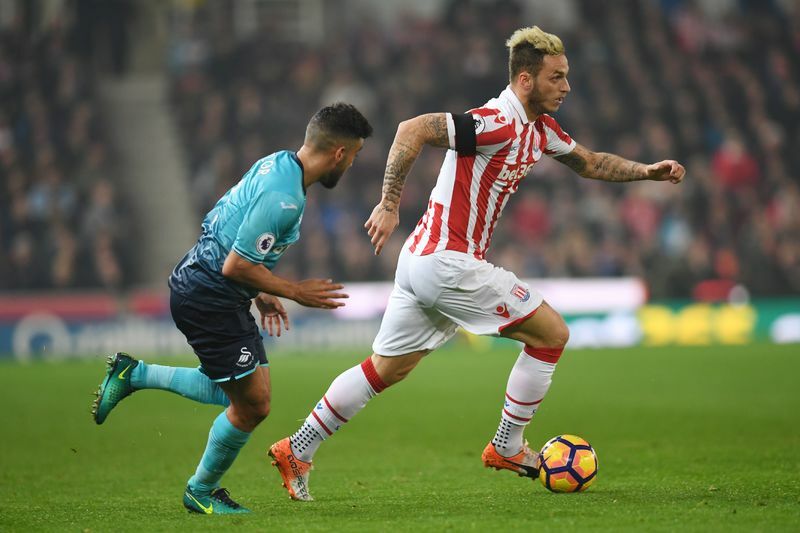 Against the post again - this time Arnautovic is denied! Ramadan does well win the ball back and spring a counter. He finds Allen who turns and runs a goal but threading through Arnautovic. He beats the offside trip, takes a touch to get past the keeper but strikes a first time effort at the frame of the goal. Swnasea sub - Naughton hobbles off with Angel Rangel coming on as a direct replacement at right back. 5 minutes to go until half-time. Little by little we have the got the knowledge where are the frames of the goal. Great save by Granty at the other end - Sigurdsson is again Swansea' main danger. Pushed around the post. Fer heads well wide from the corner. Ramadan turns past Rangel before being pulled back. Free kick awarded after no advantage for Stoke is gained. Adam's centre goes out for a goal kick though. There's the half-time whistle. 1-1 here at the break. 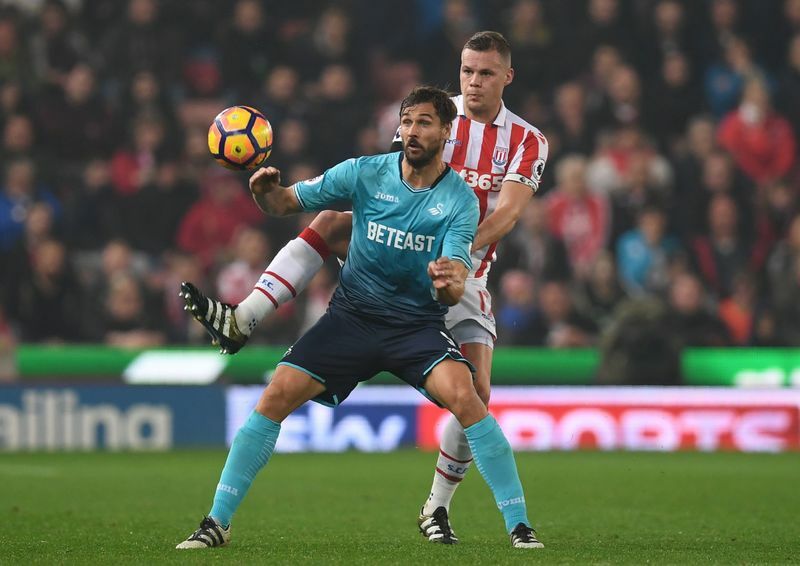 A bright Stoke from Stoke was rewarded with a goal but an quickfire equaliser Swansea has kept them in it. They've rode their luck too with the woodwork denying the Potters not once, not twice but thrice! Even Stanley Matthews expects a win under the center circle, so do I! We're back for the second half. No changes at the break. Joe Allen restarts the play. Crouch looks a bit frustrated amongst the substitutes. Wouldn't it be good if he got a chance? Stoke corner with Bony doing well to chase down Rangel. Applause from the City support. Pinball in the area from Adam's delivery with Shawcross fluffing his lines at the first opportunity before volleying into a Swansea defender. Hacked away by the visitors.